After making its presence felt at the recently concluded Consumers Electronic Show (CES) 2014 with a dual-boot tablet called 'LapTab' (read here for more), homegrown manufacturer Micromax has now launched a low-end smartphone in the Indian market. Christened Bolt A66, the device was spotted online a few days prior to its official launch by the company. In addition, Zync has also launched an under Rs 10,000 phablet, targeting the fast growing demand of large screened mobile phones in the country. Here is a look at the specifications of the devices. This one has a 4.4 inch TFT FWVGA touchscreen display (480x854 pixel resolution) and runs on the Android 4.1.2 Jelly Bean operating system. It is powered by a 1GHz SC7710G processor and has 512MB of RAM. The internal memory of the device is only 165MB (for apps installation) that can be further expanded up to 32GB with a microSD card. Bolt A66 has a 2MP rear camera with flash that can also record videos, but no front-facing camera. On the connectivity front, it has Bluetooth 2.1, Wi-Fi, 3G and comes with a microUSB & a microSD card slot. Micromax has provided a 1,500 mAh battery in the device, which it claims will provide 4.5 hours of talk time and 116 hours of standby time. In addition, the smartphone has FM radio, dual-SIM capability but no GPS. The company has also preloaded a number of apps in the device that include Spuul, Hike, Opera, and Milive, among others. The company's first device this year, the phablet sports a 6.5 inch TFT capacitive multi-touch screen display (800x480 pixels resolution) and runs on the Android 4.2 Jelly Bean operating system. 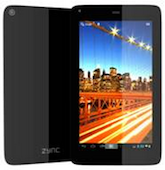 It is powered by a 1.2 GHz dual-core processor and has 512MB of RAM. The internal memory of the device is 4GB, which can be further expanded up to 32GB with a microSD card. The phablet has a 2MP PureView rear camera with optical image stabilisation, as well as a 0.3MP front-facing camera for video calling. On the connectivity front, it has Bluetooth, Wi-Fi, 3G, and a microSD card slot. Backing the device is a 2,500 mAh battery which the company claims can deliver up to 6 hours and 2.5 hours of talk time on 2G and 3G networks respectively. In addition, the device has GPS and weighs 250 grams. "In the recent past, we have seen a paradigm shift in the usage of technology like tablets, PCs and smart phones to phablets, among the youth in India. With a 6.5-inch display and a good set of features, the Z 605 comes as a tough competitor to a number of other players offering phablets housing similar set of specifications at a much lower price point," said Amul Mohan Mittal, co-founder, Zync Global.